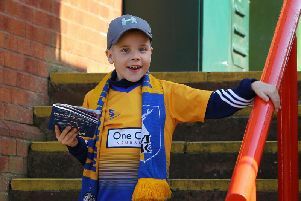 Although Mansfield Town, Coventry City and Luton Town are the bookies’ top three fancied clubs for League Two glory this coming season, Stags manager Steve Evans expects seven or eight clubs to challenge and one of the most open promotion races for some time. As Coventry and Luton add impressive names to their squads, Evans said: “We knew who Coventry and Luton were talking to. Agents are always telling other managers what’s going on, so you are aware of it. “I was impressed with the boy (James) Collins going to Luton and I think there is going to be another exciting midfield player joining them in the next couple of days. “You look at the work Mark Robins has done at Coventry. It show the type of money that can be deployed there. “But there will be other clubs that will be particularly strong in this league, not just those two and ourselves. “There will probably be seven or eight clubs who you can look at and say their squads are much stronger than they have been before. He added: “I am impressed with the work Kevin Nolan has done at Notts County. I know he’s local and they are our rivals. We want to beat them and they will want to beat us. “Also, people talk about our signings yet up across the motorway at Chesterfield they have signed 10 as well, but no one talks about it.